Translation Memory sharing is only available on the Advanced plan and up. 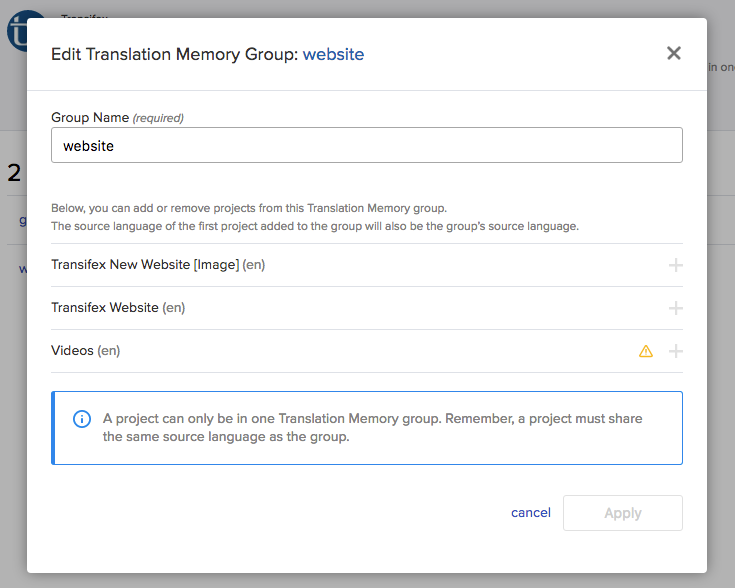 Each project in Transifex has its own Translation Memory. However, if you have projects which have similar or related content, e.g. a project for your iOS app, and one for your Android app, you can share TMs across those projects by creating a TM group. On the left menu, click on Translation Memory. Click on Add Translation Memory Group. In the popup, give your TM group a name. Select which projects to add to the TM group by clicking on + icon next to the project name. Projects in the same TM group must share the same source language. Click Apply to finish creating the TM group. A project can only belong to one TM group. When a TM group is created, it doesn't create a consolidated TM; TMs from individual projects are just shared across all projects included into the TM group. TM doesn’t share the same TM suggestions across languages that have the same country code but different locales. For example, es and es_ES are treated as different languages and don’t share the same TM entries.